Place mushroom caps on a cookie sheet. Brush caps with some of the butter and sprinkle with garlic salt. In a skillet, saute the mushroom stems with onion, Worcestershire sauce using the remaining butter. In a bowl, mix crabmeat and mayonnaise. Fill caps with mushroom and onion mixture. Top with crabmeat and Brie. 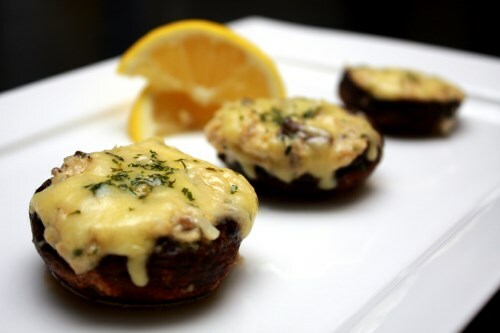 Bake for 10 minutes or until mushrooms are tender and cheese is melted.